Ninox Database - Thread / VLOOKUP formula? Support > Forum > Technical Help > VLOOKUP formula? where Norme is a table containing 33 sets of subtables named like '6a0m0g - 6a3m30g', each one containing 15 rows (selected with [PROVA= "DC"]) and 100+ columns ('2' can vary from 0 to 139). So let's say I have someone scoring N in a test [Prova = ""DC"]. I need to extract that raw score ( '2', which should be my N value) ) from the prevoiously chosen subtable ('6a0m0g - 6a3m30g'). Hope that was clear. Otherwise I can provide further details. We would like to understand your enquiry better. Could you please send us an e-mail to support@ninoxdb.de and explain a little bit more detailed what do you want to achieve and what do want to have as the result? That would probably help us to give you a better support. I explained my issue via email, but since it could help other users I provide a visual description here. Thanks for the quick response! I haven't yet figured out how to convert my situation from your example, but it has given me a path. Thanks again! No problem. Just ask if you need more, as it may help other as well. Mine ended up being a bit easier than expected. I just needed a simple lookup from one table to the next. My mistake was not understanding that the "select" funciton returns an array so it didn't know how to return one value in the 'Hours' column. 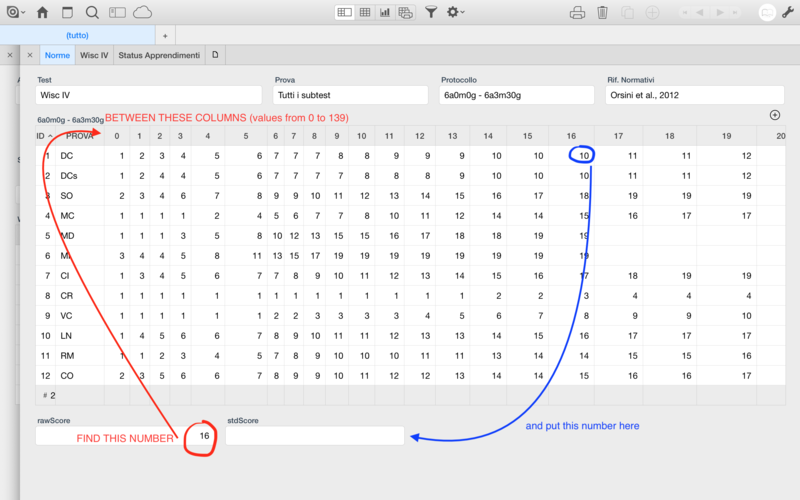 'Tree DBH' is an entry field in the Calculations table that I want to use for look up. 'Felling DBH' table contains 2 columns, DBH and Hours. I want to look up "Tree DBH" and return the corresponding Hours field.